One night two teenagers wanted to do a prank that people won’t forget. They thought for a minute finally they got idea to destroy the first bottle that was made in the world . In a tale who every breaks it will be the same size as it and will very ugly, They didn’t know about it. They sneaked to town, Took and destroyed it. They went home, After they went to bed few hours later they woke up saw that the bed so big. Suddenly he looked at himself in mirror and say he was tiny and that he was uglier then a pig he never told anybody and nobody ever saw he again. Lots of pranking stories this week… maybe I should keep an eye behind me in class, just in case Collins!! The prankster certainly had the tables turned on him – maybe he should have asked around about this first bottle before deciding to destroy it… Another top class effort, well done Collins! Hi Collins, you’ve certainly put a lot of thought into this week’s 100 wc. I enjoyed reading about the prank. I wonder what was in the ‘World’s First Bottle’? I guess we’ll never really know. I like the way you said he was uglier than a pig, it was very funny.I hope you write more. I’m blown away!!! 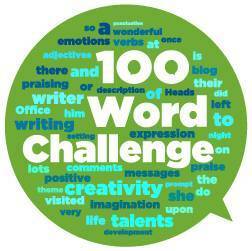 This is my first 100 word challenge of the year that I am reading as part of Team 100wc and I’m SO impressed. The ideas in your story are so incredibly creative and if there was to be a moral to the story I suppose that it would be that pranks are probably not such a good idea. However you really got an amazing story across in just 100 words. I love the idea of the world’s first bottle and how they didn’t know about the strange effects the bottle could have if broken. Well done. A great piece of writing. Keep up the good work!